I went through a range of conflicting emotions that are hard to explain while watching this movie. It was wonderful, yet boring, yet interesting at the same time. It was tragically sad, but hopeful and beautiful all at the same time. I can't even decide whether I liked it or not. 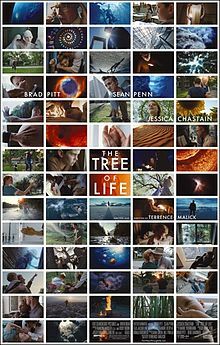 I will say this: if you can get through the first 45 minutes of the film, which is basically a nature slide show set to choral music in an attempt to show the creation of the world, the movie really picks up from there. The movie is largely silent and a good portion of it has only a whispering narrative. It's not for everyone. I, for one, don't mind whispering narratives. I find them soothing. It's one the reasons The New World is one of my favorite movies. But I understand how they can annoy the crap out of people and I have learned to stop recommending The New World to people, as no one else has told me they enjoyed it. Brad Pitt does an excellent job in the movie and it's nice to see someone that is generally loved portrayed as a character you find yourself disliking, but then sympathize with by the end. It reminds me of the character arc of Natalie Portman's character in The Other Boleyn Girl. There are obvious heavy religious themes running throughout the movie, but I didn't find they detracted from the storyline or made it too cheesy. The director definitely let the cinematographer run [a little too] wild with the long stretches of panoramic shots and artistic still shots, but I suppose it paid off since he got an Oscar nomination for it. The only movie in recent history that comes to mind that compares to it is The Fountain. I found The Tree of Life to be better, but I think their artsy vibe and themes are comparable. Final word: The movie is beautiful and certainly different, but I have no idea who I would recommend it to.